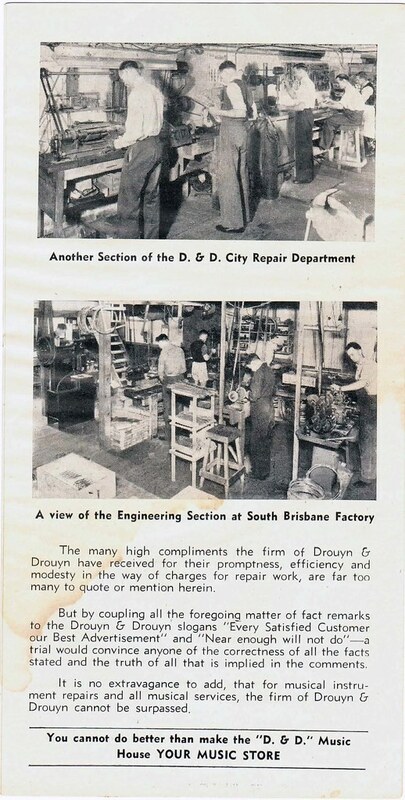 The story of Drouyn and Drouyn, musical instrument makers from Brisbane, Queensland is one that deserves to be told in full. 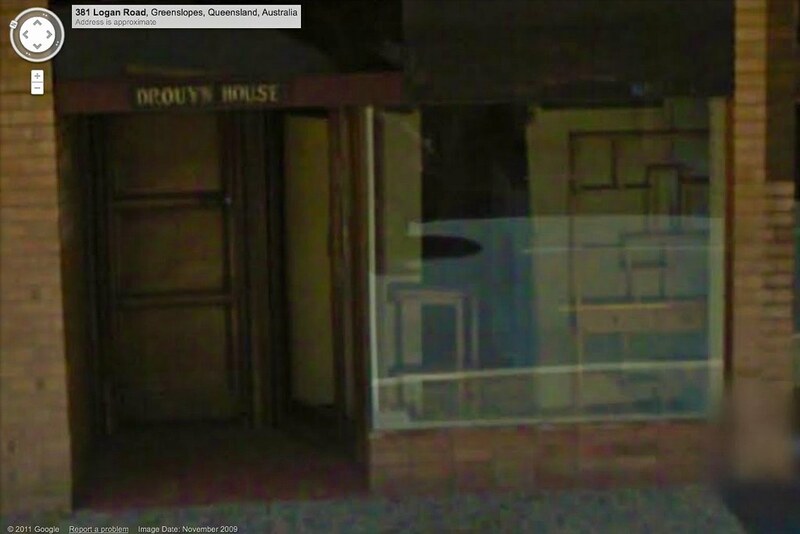 However, there is very little evidence left of this successful Australian company, except for the instruments themselves; and even these are rare. So these pages are an attempt to contribute what I can to the story; and to help to solve some of the “mysteries” of these fine drums. I can’t guarantee everything here is completely correct, although I have certainly tried to verify facts where possible. I welcome corrections and contributions. If you have anything to add, please contact me. Many of the images in this section were generously provided by Dimitris Petinakis, whose family now owns the Drouyn House site on Logan Road. My sincere thanks go out to Dimitris. 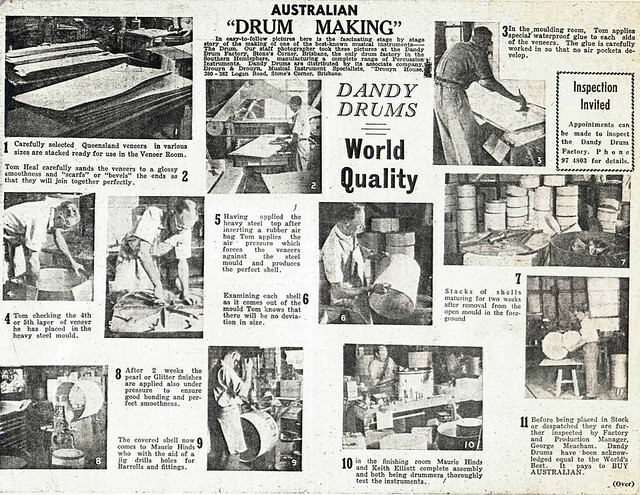 Long before Brady; long before Sleishman (who play their own role in this story) there were Australian drums being made in a small factory in the suburb of Stones Corner, Brisbane, Queensland. The founders were brother and sister Douglas and Dorothy Drouyn (pronounced “drew-in”) shared a love of music. Douglas Drouyn was an accomplished musician. A search through the National Library archive Trove finds many mentions of his gigs, including a tour through Queensland as far north as Cairns, in 1939. 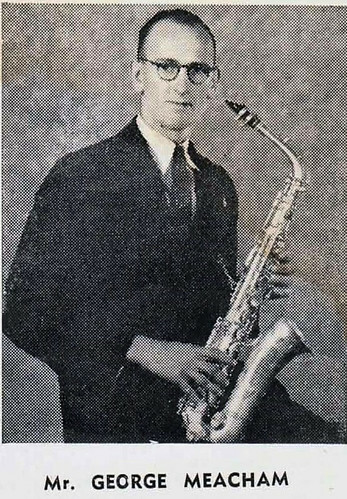 He played baritone saxophone in a duo with an accordianist, Ossie Mazzie. They were good enough to tour, act as leaders and pick up support bands; and were certainly popular. Dorothy Drouyn was also musical – it’s reported that she wrote operettas. Douglas Drouyn was a man with strong opinions. He had a long running battle with the Tax Office; eventually taking the matter to the High Court. A judge in one episode of this trial noted that Douglas was not so much an activist, rather, “someone suffering from mental indigestion”. However he certainly felt very strongly about sales tax and ruffled a few feathers, because he was also investigated for his alleged links to the monetary reformist Green Shirt movement. Whatever his political beliefs, his partnership with Dorothy flourished. 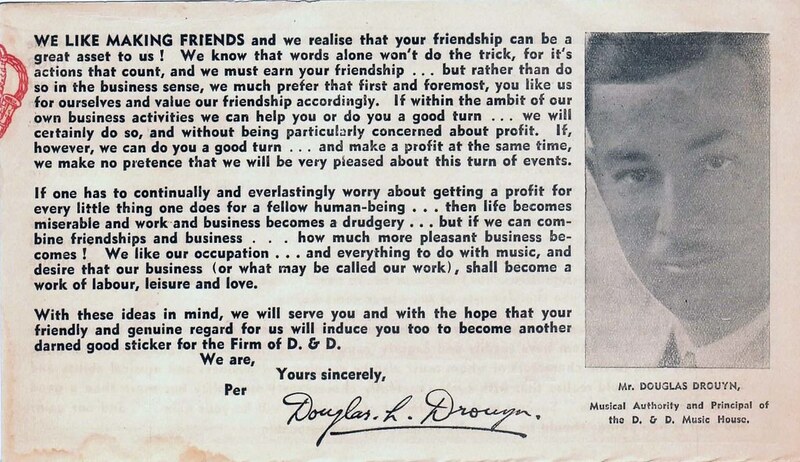 Douglas and Dorothy became business partners in 1927. 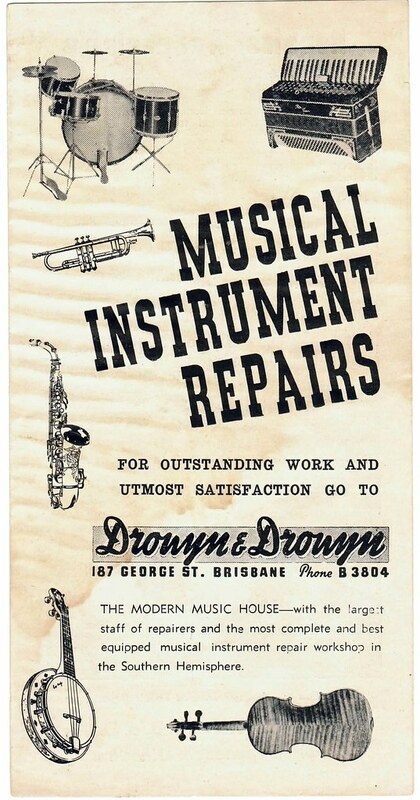 In 1932, they opened a music store in George Street, Brisbane which specialized in instrument repairs. The following images provide a fascinating insight into the business. 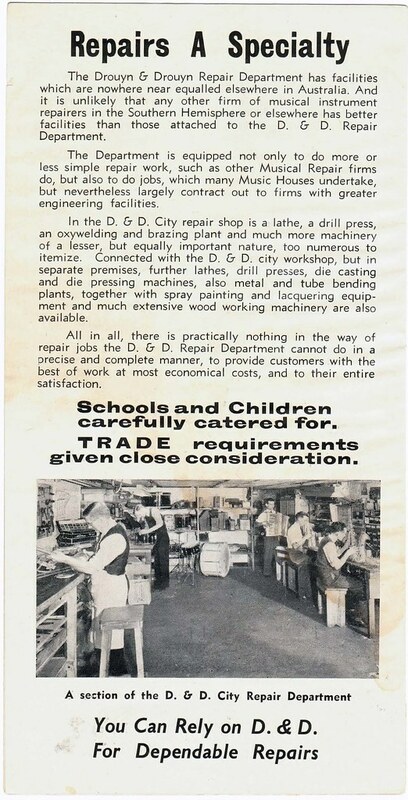 This went so well that they purchased a small building in South Brisbane and began making drums and other small instruments under the “Dandy” brand name. 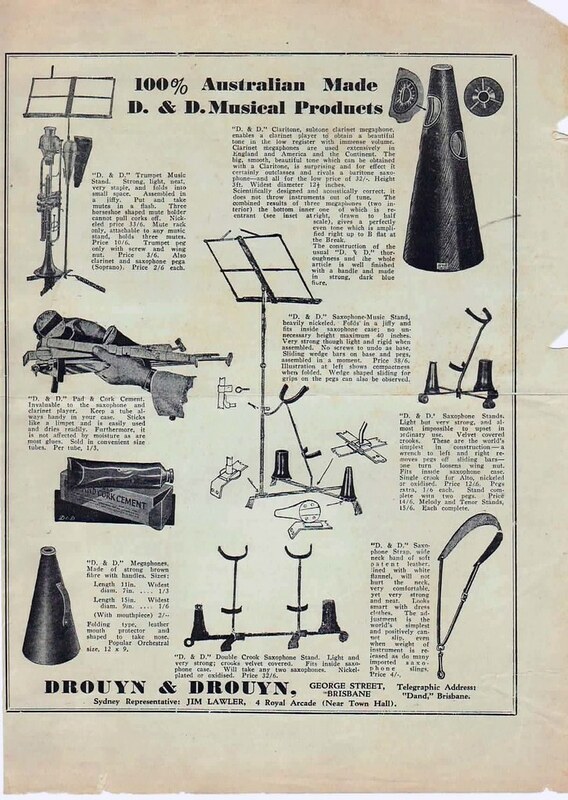 This early interesting Dandy catalogue includes megaphones! 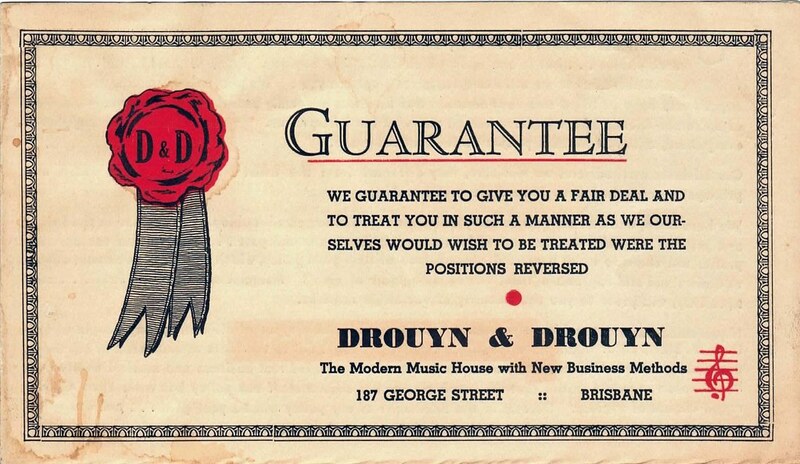 A Drouyn ‘guarantee’ brochure. 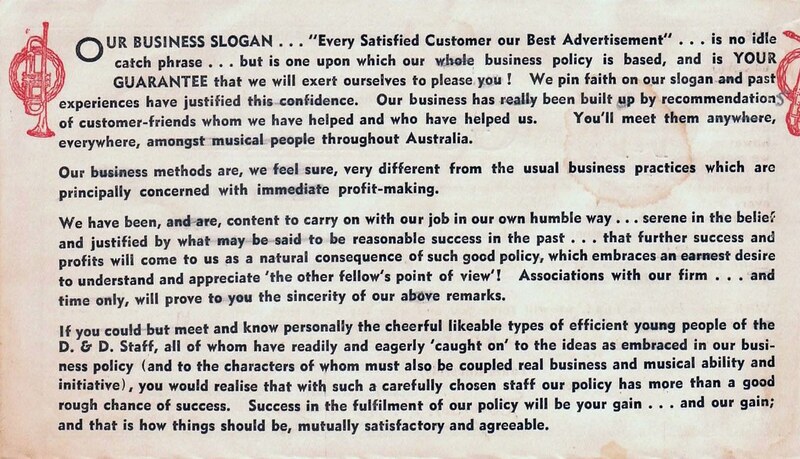 Douglas Drouyn certainly wrote good copy; and his business philosophy seems consistent with his political views. Drouyn House entrance. The factory is in the rear. It has been empty for many years, and is not in good condition. Drouyn and Drouyn made concert band instruments, especially for schools. With war shortages and trade restrictions, there was a good local market for these products. 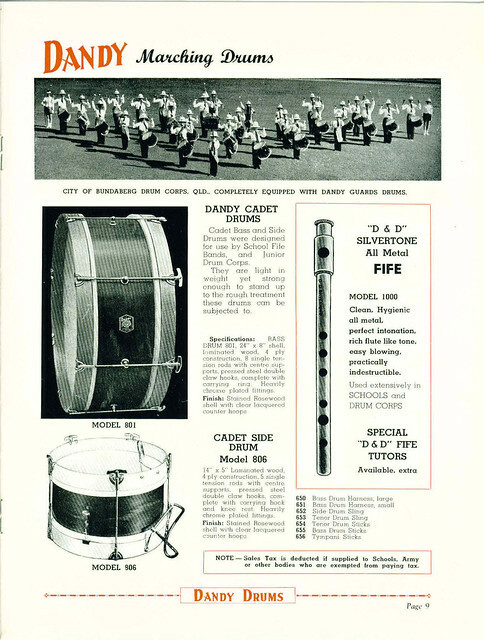 Apart from the usual snare and bass drums they made a successful flute called “The Silvertone” and it’s estimated that they also made approximately 40,000 fifes. Folklore has it that old ammunition boxes were recycled into hardware for the first drums made in the new factory. Whatever they were made from, they were well received. Page 9 of the 1960 Dandy catalogue. A detailed explanation of the Dandy production method. By now, George Meacham was in charge of the factory. Douglas Drouyn must have been very pleased to find such a skilled engineer and a musician to boot. 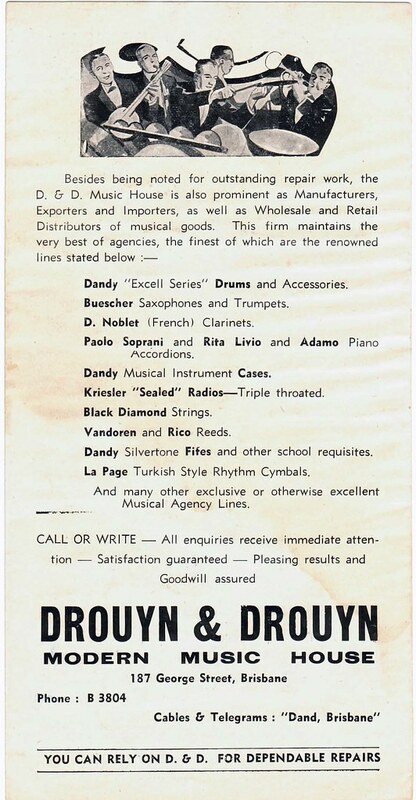 Being the only well known manufacturer of concert band instruments in Australia, Drouyn and Drouyn also gained important military contracts. 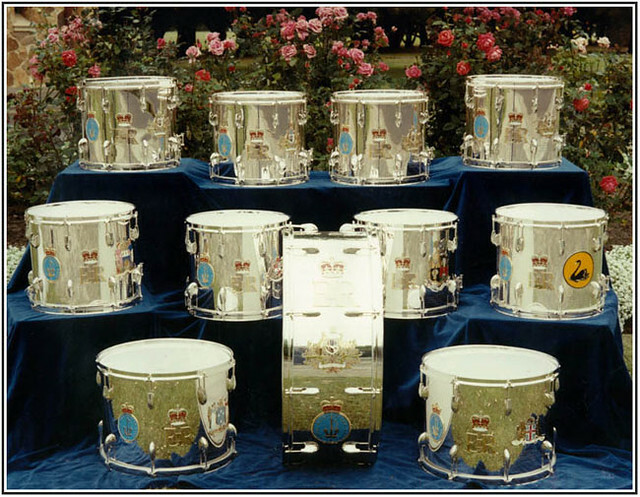 One of the most famous of these was the order for a complete set of solid silver concert drums to celebrate the Royal Australian Navy’s 50th anniversary. Employees later recalled that every grain of silver had to be weighed and accounted for, even the waste from drilling. The drums are now in the RAN Museum. 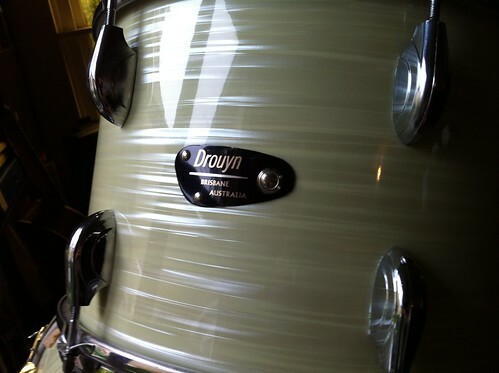 One of the questions often asked about Drouyn and Drouyn drums is: what were they made from? Odd as it may seem, this information was not heavily advertised by drum companies in the 1960’s. It was considered to be important that drum shells were strong and round; but the composition was not a major selling point. 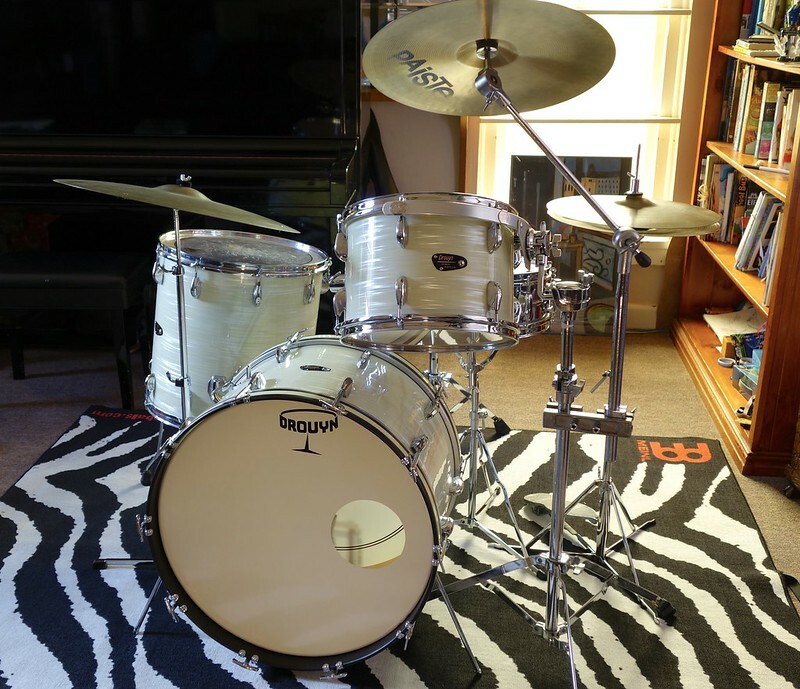 Market leaders like Ludwig, Gretsch, Rogers and Slingerland mostly wrapped their drums in plastic covering, then sprayed the inside of the shells with paint. They used everything from undercoat, house and even automotive trunk paint, at the same time inventing exotic names and bestowing magical sonic properties on the result. All this changed in the 1980’s when clear drum skins became all the rage. This probably led to clear finish interiors; which created its own problems for drum makers, because now every small flaw in the timber could be clearly seen. The 1960 Dandy catalogue makes interesting reading. (you can download it here) It does give a few clues as to what was involved in making a drum kit in the Stones Corner factory, including the number of plies. But the composition of the drums is not mentioned. However, “heavily and brilliantly chrome plated” certainly is; 24 times in 16 pages. In 1960, chrome was more important than wood. So what were Dandy/Drouyn drums made from? Some were made from a native tree known as Rose Alder, or Caldcluvia australiensis. Drums overseas were being made from maple, birch, ash, mahogany and poplar. But Drouyn could not have used maple or any other exotic overseas timber in their instruments, without extra effort and expense. Australia has stringent import restrictions. So imported timber is expensive. Rose Alder is a Queensland rainforest tree, with a wood specific gravity of .57. 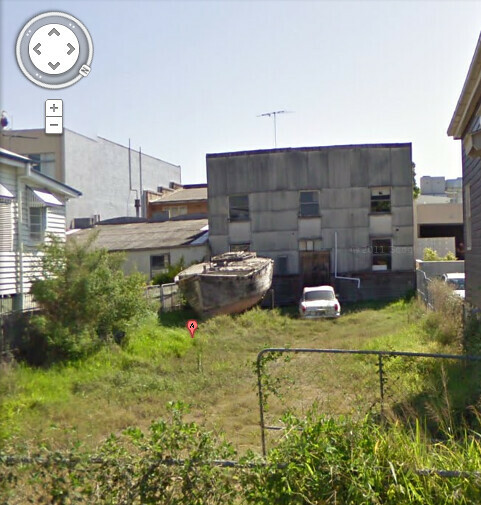 It’s now rare; and protected by World Heritage listing. However in the 1960’s it was popular for fine furniture; the first choice probably being Queensland Maple, which is still widely considered to be one of the finest decorative woods on the planet. 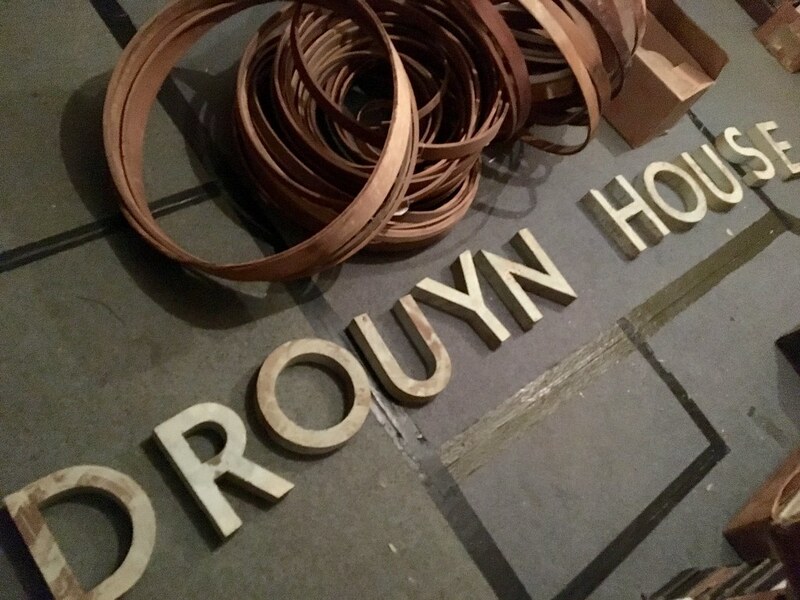 It’s likely that Drouyn experimented with many different types of local timber. It has been reported that they used rose alder, Queensland maple, huon pine, jarrah and other native timbers. 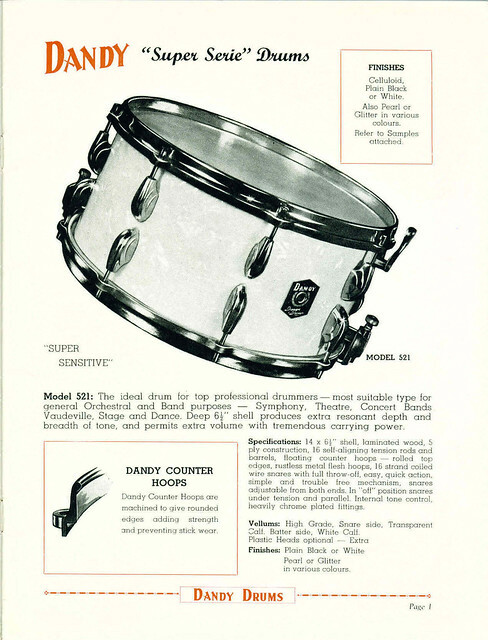 Drum historians were quick to notice the similarities in design between the distinctive Dandy/Drouyn bass and tom lugs and the ones used by English drum makers Premier in the 1930’s. 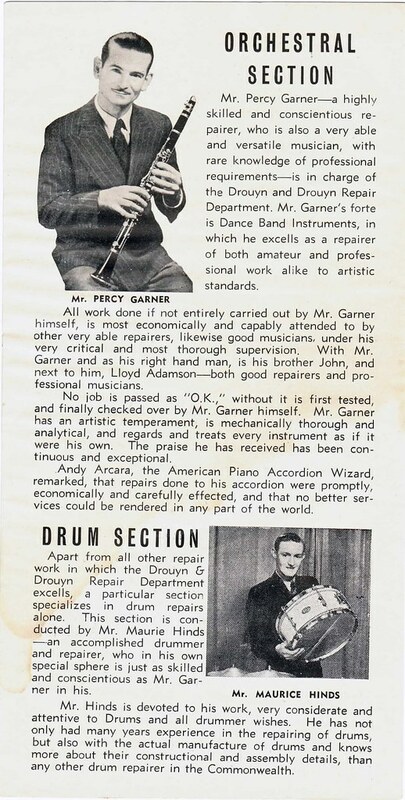 Premier was one of the most influential drum companies in the world. Drouyn used other parts from Premier, such as stands and tension rods. It’s not clear however, if Drouyn purchased the molds for the lugs from Premier; or the complete lugs; or simply copied them. George Meacham and the Gretsch effect. If there is anyone apart from the Drouyns who was key to the success of the factory on Logan Road, it was an employee by the name of George Meacham. 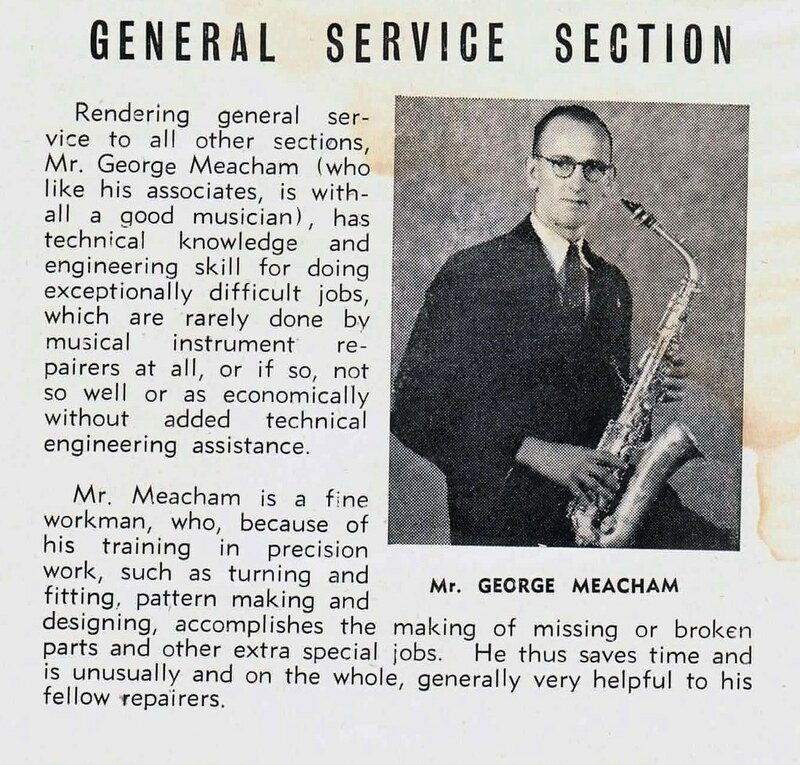 George was a trained machinist as well as a musician. He was one of those people who could make virtually anything. George ran the factory for 44 years, designing and implementing much of the manufacturing. His input was vital, especially in two areas. Dandy/Drouyn drums had no internal reinforcing rings. Reinforcing rings are strips of wood fixed inside drums at the top and bottom of the shell, to keep the drum perfectly round. They allow shells to be thinner, yet stay in shape. They also allow for a more engineered bearing edge. Reinforcing rings add to the overall complexity of making a drum. They have to be exact in diameter and fastened correctly, or they may even act as a dampener on the sound. 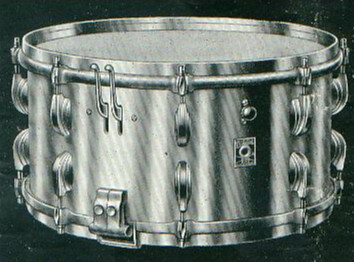 Gretsch USA were highly regarded drum makers of the period. Their shells also had no reinforcing rings; and a rounded bearing edge. To enable this to happen for Drouyn, George Meacham designed a mold with an inflatable bladder, which was used to hold the ply drum shells perfectly round, while the glue set. This would be one of the first times in the world that this method was used. Some time between 1960 and 1965, the Dandy brand was dropped for “Drouyn”, with a new badge and a new look. The drums changed, though not across all areas of the kit. The biggest change was the snare drum. In keeping with overseas trends, hoops with clips disappeared and new materials were used. Catalogues from this era are very rare. 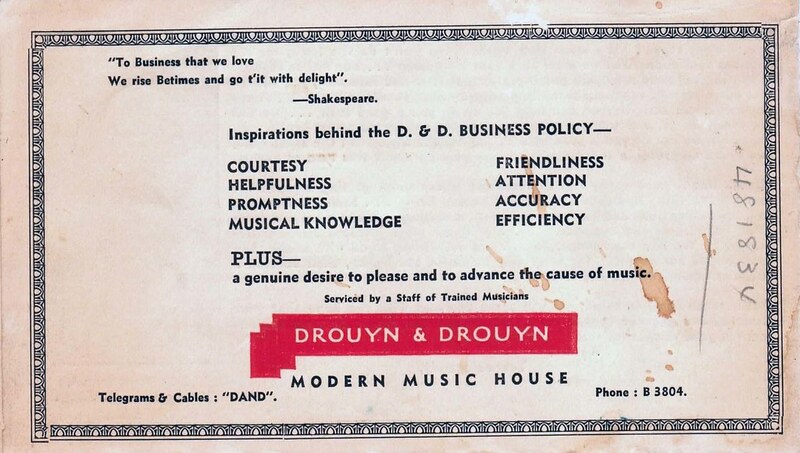 The 60’s and 70’s were good for Drouyn. But there were big changes on the way. 1965-1975 saw the rise of rock and roll; pub bands; cabaret; the “Americanization” of Australia – all of these trends affected the company. As the 1970’s drew to a close, bigger changes in the global nature of the music manufacturing business saw the demise or sale of legendary names such as Rogers, Fender, Gibson, Slingerland and Camco. They struggled against the unstoppable rise of brands from Japan. Some were lucky enough to be reborn in the 1990’s, but for many it was the end. Doug and Dorothy passed on the business to other family members who tried to keep the brand afloat. Sleishman drums, one of the next generation of Australian drum makers, used Drouyn shells for all their early kits. It was a good partnership. 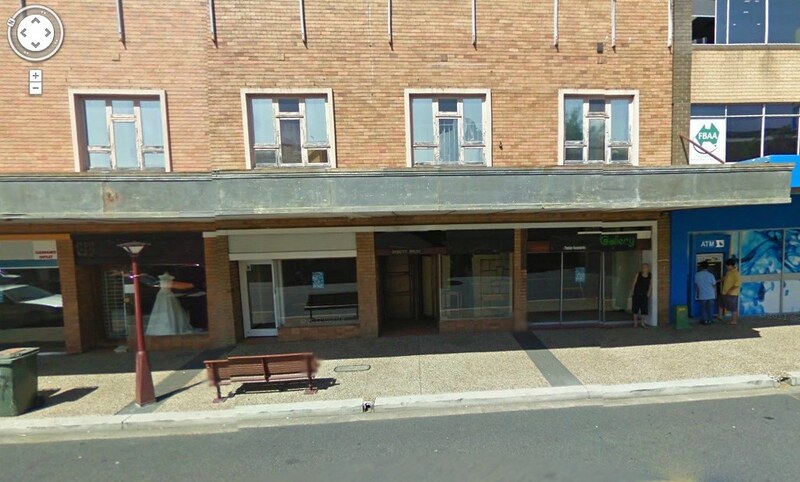 But in a story which is sadly familiar in manufacturing in Australia, the factory finally closed it’s doors sometime in the late 1980’s.